Valentine’s Day isn’t until tomorrow, so before you make reservations or scramble for last minute flower and chocolate orders, take some time to celebrate another holiday: Clean Out Your Computer Day. That’s right, Clean Out Your Computer Day falls on the second Monday in February every single year. And it certainly feels like Monday today, so that means it’s time to give your old machine some love. Seriously, when was the last time you defragged that bad boy? Or fixed your registry errors? You probably have at least two dozen programs cramming up your start up menu right now. Think of all the junk and clutter and unwanted programs that you have running on your PC right now. So yea, it’s time to give your comp a good solid scrub. Free up some RAM. Accumulate some speed. Make that thing run like it used to. How you ask? Well if you’re super on the ball and you perform regular maintenance on your PC, then you already know what to do to speed your machine up. But most of us lag on that stuff. 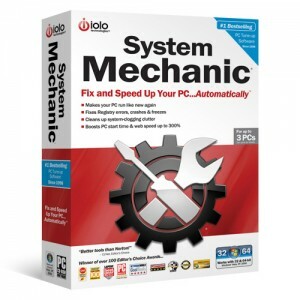 So that’s why they make all in one tools like System Mechanic from iolo technologies. System Mechanic is a software suite that includes more than 50 tools that will clean out and optimize the performance of your PC. The software lets you free up drive space, remove junk files and get rid of system-clogging clutter. It can find and repair security flaws, remove spyware, fix registry problems, update drivers, defrag memory, turn off unused background programs and optimize your Windows start up and Internet settings. System Mechanic sells online for $40. If you want your machine to run like it used to and you aren’t going to put in the effort to gut the thing yourself, might as well drop the cash to increase performance. Enjoy the holiday, get rid of the junk and get your system back in order. Print article This entry was posted by Thomas Ellenbogen on February 13, 2012 at 10:36 am, and is filed under News. Follow any responses to this post through RSS 2.0. Both comments and pings are currently closed.